Mars Exploration Student Data Teams (MESDT) is a free nationwide planetary science centered research experience which immerses teams of high school and undergraduate students in authentic problem based STEM research experiences. Students and their teachers are invited to join the science team in the analysis of data from the CRISM instrument, sometimes never before seen, to search for clues in the mineral fingerprints to the mysteries of the Red Planet's ancient and possibly watery environment. Students work with their teacher mentors and scientists to analyze this Martian mineral data, make hypotheses and submit and defend proposals to peers and science team members via distance learning technologies. The goal of the program is to expose students to new STEM skillsets and build student confidence to pursue STEM majors/careers. Students gain skillsets in STEM areas such as planetary geology, spectroscopy, software skills, practice and confidence using multiple data sets and programs, critical thinking, analysis and teamwork. Teachers report a striking impact on student's problem solving skills, self-confidence, and even overall interest in academic pursuits. 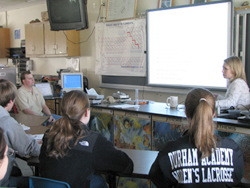 A 2014 formal evaluation reported that MESDT “captures students’ interest, generates excitement, offers unique opportunities to research ‘real world’ science, encourages teamwork and develops skill sets that serve students well in STEM careers. It offers students intensive, meaningful and repeated exposure to NASA mission-related science over an entire school year. This intensity and the diversity of experiences have resulted in lasting effects on student participants including ‘changing the course of their lives.’ ” Please see “Formal Evaluation” menu tab to read the full evaluation. No prior knowledge or experience is needed to participate. Students and their mentors are provided with CRISM curriculum, support resources, as well as live support throughout the program. The Mars Exploration Student Data Teams (MESDT) program that was conceived of by Arizona State University’s Mars Education Program, operates with the support of Mars Reconnaissance Orbiter (MRO) Project Office at the Jet Propulsion Laboratory (JPL), the Johns Hopkins University’s Applied Physics Laboratory (JHU/APL), and the CRISM science team which bears responsibility for administering and delivering the program. To apply please go to: Application. CRISM Science Operations Team Members Kim and Frank Seelos visit Durham Academy (Durham, North Carolina). MESDT students from Bozeman High School analyze CRISM data (Bozeman, Montana).